Where is Jesus now? 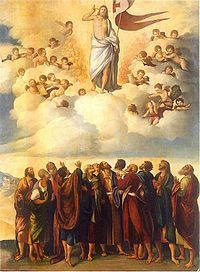 The Ascension answers that question. We know that Jesus is at the right hand of the Father. He is ruling and reigning from his heavenly throne. He has given the Father the kingdom, and now he is preserving, progressing, and perfecting his kingdom. He is bringing all things under subjection. As we come into worship, remember that you are worshiping the One who understands your needs, because he has a body just like you; he understands your joy because he has a body just like you. And so he calls us to worship him in spirit, but also with our bodies. So, let us spiritually and physically ascend to the heavenly city. This entry was posted in Ascension, Exhortation. Bookmark the permalink.